Pink Wings.com is a website dedicated to making a difference. 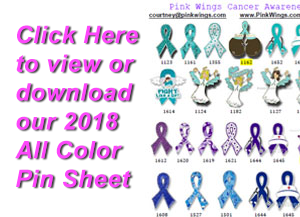 Click on a photo above to visit our online store, where we carry a wide variety of Breast Cancer and Pink Ribbon Awareness Products, including Awareness Pins, T-Shirts, Gifts, Hats and other great products for your Breast Cancer Walk. We now carry many of our popular pin and key chain designs in other cancer awareness colors. By purchasing Pink Wings products, you can make a difference. You are showing support and awareness of Breast Cancer. 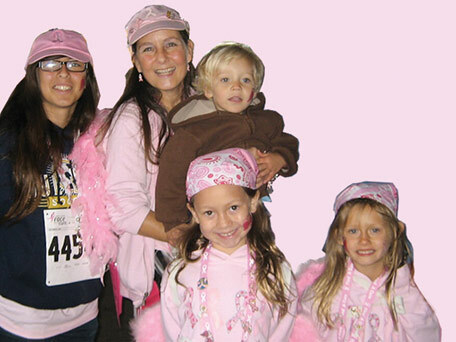 Up to 20% of our net proceeds are given to benefit Breast Cancer Organizations. 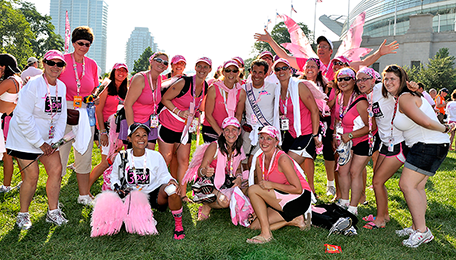 Courtney with team Pink Wings at the Boston 3-Day walk in 2009. Our team of 21 was #3, raising over $47,000. Courtney's Amazing Race from Courtney Zinszer on Vimeo. as part of the Youth Corps. when she appeared on his Talk Show. and Kim Raver (of "Lipstick Jungle"
Lisa Ann Walter of "Shall We Dance"
Pink Wings team at the Chicago 3 Day in 2010. We were the #1 team for fundraising. Site Credits: Image Market Inc.